We are a family run country Inn based in the heart of Perthshire. Our bar and lounge is a place where you can relax and put your feet up while having a cold drink! Sky Sports is ready and waiting to cover any of your sporting needs. A friendly community pub, with quality beer and service with live music and sport. We are dog Friendly and dogs are welcome to stay overnight. We have two Labs of our own and they are great ‘pub dogs’ greeting all guests as they arrive. 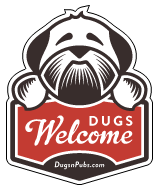 There are a total of 46 dog friendly listings in the Perthshire Pubs category. Please log in, or sign up as a member to view all listings.